The Treasurer in his 2017 Budget speech stated that there was a “K1.1 billion reduction in expenditure in 2017” compared to the revised 2016 level. I decided to look at the Appropriation Bills for General Government Expenditure for 2016 and 2017 to confirm this and I was shocked to discover that the actual increase in 2017 payments is K7.3 billion and not a decline. The total payments estimated for 2017 is K21.1 billion compared to the 2016 original estimate of K13.8 billion (see Figure 1). Copies of these Bills are available at the Department of Treasury’s website: www.treasury.gov.pg. It takes some working through the numbers to figure out what is going on. Firstly, in line with the Constitution (section 209) three separate Appropriation Bills are required for the three arms of Government – one for Executive Government (shown above), the Judiciary and National Parliament. The Appropriation Bill for spending by the Executive Government is called the Appropriation (General Public Services Expenditure) Bill. Further, the Bill is for total payments made by Executive Government and includes expenses, transfers, capital expenditure and debt repayments. Secondly, when the Government talks about expenditure level it does not include loan repayments as this are “below-the-line” items, that is, they are balance sheet transactions. However, all spending of public funds (both expenditure and loan repayments) must be first authorized by Parliament during the Budget process. This is a specific requirement of Section 209 of the Constitution. After carefully, scrutinizing the numbers I realized that National Parliament did not make an appropriation for debt service in the 2016 National Budget. But National Parliament only considers what is put before them by the National Government. The 2016 Supplementary budget did not correct this omission either. Nor was there any revision as part of the 2017 National Budget. The implication of this is that the Government has already spent and will spend up to K9.9 billion unlawfully (i.e. in contravention of the Constitution) by the end of this year. To understand this fully, it is best to consult the 2017 National Budget documents (Volume 2a, also available at www.treasury.gov.pg). This document shows that the total payments to be made by Government (i.e. 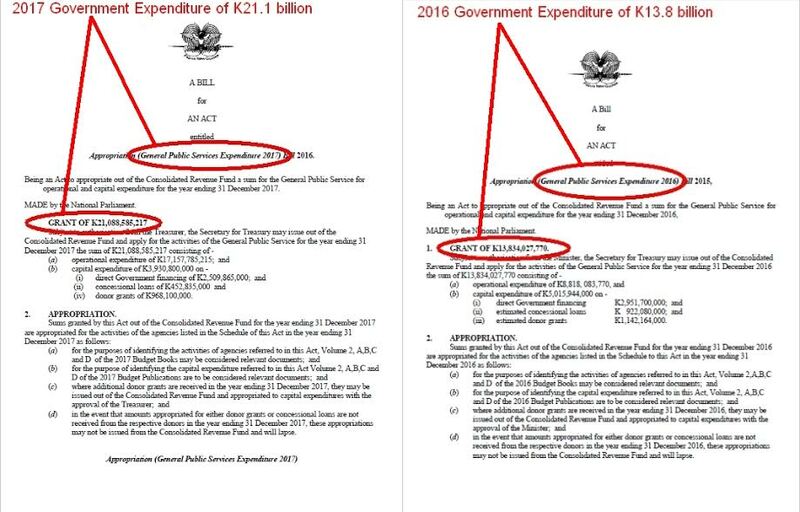 Executive Government, National Parliament and Judiciary) are K23.8 billion but the sum of the Appropriation Acts (after the 2016 Supplementary Budget) is only K13.3 billion. This is summarized in Table 1. The Appropriations’ shortfall is K10.5 billion and most of the difference can be attributed to loan repayments of K9.9 billion. This is an extraordinary mistake to have made and I am puzzled and shocked as to why it has not been corrected. I wonder if the Prime Minister and his Minister for Treasury are aware of this but have chosen to deliberately ignore this constitutional breach. I wonder if the Departments of Treasury, Finance and National Planning & Monitoring were aware of this but failed to bring it to the attention of Government. Who is accountable for this shocking breach? Excellent piece of 2017 National Budget analysis very simple with facts and data encapsulating source of Budget Volumes. I commend your presentation for public consumption. Thank you @Allan. I must say this is not the analysis of the Budget itself. I picked it up whilst trying to confirm the figures to do the analysis. My aim to make the budget stuff simple for ordinary people’s consumption. Thanks for the comment and subscribing to my blog. K7.3 BILLION?? Either people need to be schooled on their Grade 1 Maths because they clearly don’t know the difference between – & + AND the numbers 1 and 7 OR the counting system in PNG has changed and you Kessy have not been informed. I mean what else could it be right? @Samoka, that’s my shock. Why can’t we get the basics right and have it done lawfully? This is scary. Oh my gosh.. Thanks @PNGToday for commenting and subscribing. Kessy. .. you have eyes of an eagle and mind and heart of a true patriotic Melanesian. …Anutu bai stap wantaim yu. Thank you @Ken for those uplifting words na Amen! Anutu stap na yumi stap! Thanks for commenting and subscribing to my blog. Here are some that I have, prompted by comments on FaceBook. 1. What was the total unauthorised repayment expenditure in 2015? 2.If the repayment expenditure has not been authorised by Parliament through an Appropriations Bill, as required by the Constitution, what is the status of the debt raised? Are the Treasury Bills and Inscribed Stock issued to raise the debt unlawful as well? 3. Does the failure to authorise repayment also cover Bank of Papua New Guinea paper such as Central Bank Bills? 4. Do the purchasers of the debt – presumably institutions such as NasFund, Nambawan Super, BSP, Westpac, ANZ and Kina Bank – have a legal right to repayment of the amounts outstanding given that repayment has not been authorised by Parliament? 5. How long have the Prime Minister, the Treasurer, the Bank of PNG and their officials known about this? 6. Why was the breach of the Constitution not immediately rectified? 7. Is a retrospective Appropriations Bill a legal solution? 8. 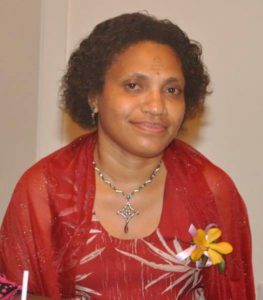 Has a crime such as fraud or misappropriation been committed by those responsible for authorising the issuance of the debt in 2015 and 2016, including the Secretary of Treasury, the Governor of the Bank of Papua New Guinea and their responsible officers? Has the Public Finances (Management) Act been breached? Similarly, has a breach of the Leadership Code occurred? Hi Mark, all valid questions you’ve raised. I’m not a Constitutional Lawyer so I might err in any attempts to answer some of your questions. I will however write to Constitutional Lawyer Nemo Yalo and Bryan Kramer who writes a lot of legal stuff on social media seeking their views and interpretation. Thank you for taking the time to put these together and for commenting on my blog. It seems that the appropriation budget has been a hiccup. Oops. I did it again? If they cannot get the fundamentals right… how do they expect people to have confidence in the more esoteric regions of finance they venture into? Exactly! Even though this has been highlighted, nothing has been done about it so far. Thank you Kessy for an excellent analysis – informative, yet very easy for the lay person to understand. I have been following Paul Flanagan’s blog , ‘PNG Economics’ (that’s where I got the link to your blog – with excellent recommendations I might add) for some time now and your analysis only confirms what he has been saying all along – “Economic management in PNG is not going well”. It is indeed a very frightening prospect for our young nation, and I feel for our up coming generation; the burden they will have to shoulder. – Was this deliberate or a “silly mistake”? Keep up the good work and God Bless you as you continue advancing our women’s and girls causes. Thank you Kelly for your kind words. Appreciated. It is now upon the Government to prove that it was a mistake by taking some responsibility to correct the mistakes. The other question is “who should be held accountable” for this breach.